WEST PALM BEACH, Fla. — The International Hot Rod Association (IHRA) announced today the complete 20-race schedule for the new IHRA Summit Sportsman Spectacular. The historic Wilkesboro Dragway, Wilkesboro, N.C., has been added to the schedule. The IHRA Summit Sportsman Spectacular will produce a fun double-race weekend with increased purses that is affordable for grassroots, bracket-racing competitors who support their local tracks each week. The opening weekend of races is March 9-11, 2018 at Xtreme Raceway Park, Ferris, Texas and Farmington Dragway, Mocksville, N.C. The races feature a $10,000-to-win payout on Saturday and a $5,000-to-win race on Sunday. There is a national contingency program available to all IHRA members who advance to the final two rounds each day. 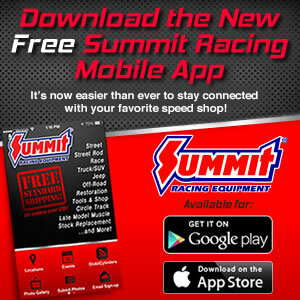 As part of its contingency program, Summit Racing Equipment will now pay for the win, runner-up and semifinal positions.In addition, there are cash bonuses for the IHRA Summit SuperSeries member that goes the furthest in eliminations or wins the event. On-site entry fees for the season-opening races are $150 for Saturday with a $10,000-to-win payout, $2,000 for the runner-up, $1,000 for the semifinals, and $100 per round starting with Round 3 winners. For Sunday, entry fees are $100 (for anyone not pre-entered) with a $5,000-to-win payout, $1,000 for the runner-up, $500 for the semifinals and $100 per round starting with Round 3 winners. Pre-entries are available until Feb. 26, 2018 for the first two events of the season. Pre-registration will close for all events two weeks prior to each event date. Click here for online registration. March 9-11 — Farmington Dragway, Mocksville, N.C.
April 20-22 — State Capitol Raceway, Port Allen, La. May 18-20 — Keystone Raceway Park, New Alexandria, Pa.
May 25-27 — Darlington Dragway, Darlington, S.C.
June 28-July 1 — Wilkesboro Dragway, Wilkesboro, N.C.
Aug. 17-19 — US 131 Motorsports Park, Martin, Mich.
Aug. 24-26 — Maryland International Raceway, Budds Creek, Md. Sept. 28-30 — Memphis International Raceway, Millington, Tenn.